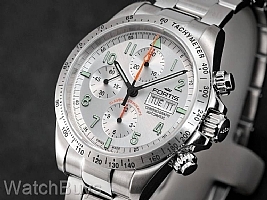 The Fortis Classic Cosmonautis watches differ from the Fortis Official Cosmonautis watches in several important ways. First, the case finish consists of polished, satinized and brushed elements to create a fresh look. Next, instead of the traditional solid case back Fortis has used a transparent case back to view the movement. And finally, Fortis has designed a new steel bezel for this watch with tachymeter. The Fortis Classic Cosmonauts Chronograph Steel AM features a 42 mm case with complete chronograph functions. The dial is light silver (hence the AM in the name of this watch), with the hour and minutes hands trimmed in black with applied green SuperLuminova and a black seconds hand. Accentuating the dial are applied numerals and indices, also coated with SuperLuminova. Screwed pushers drive the chronograph, which features a central chronograph hand and subdials at 12 and 6, all with bright orange hands for easy identification. The stainless steel bezel complements the case design and finish, providing balance to the watch as a whole. Integrated into the bezel is a tachymeter which can be used for speed calculations. This watch is fitted with a Fortis stainless steel bracelet with locking clasp.